← Hatching The Past in the Catalonian Pyrenees! That was then… this is NOW! Paul Sereno has released his new version of Spinosaurus… the details are still to be disclosed, but by what I saw in the little picture of his new mounted skeleton, this animal is even weirder than we ever thought, so I have acted accordingly and drastically modified my old version, making is more “current”. I’m doing this rather conservatively… I mean, it is still a sail in my reconstruction… I could have made it a proper Bactrian camel-like dinosaur… but I think the spinal processes are too high to do a bison or camel-like reconstruction like I did with Deinocheirus! However…I still would do it if pushed just a little bit harder… in the meantime, I think it makes sense if we considering that Ichthyovenator also seems to have a deep gap in the middle of the sail! Where Paul Sereno got all the extra material to reconstruct such an incredible sail and neck is still not clear. I’m probably more intrigued by the stiff neck. Hopefully more will be known in the future when Paul publishes everything. By the way, it seems that this artwork was right on time and will make it to the new African Prehistoric Life book by Anusuya Chinsamy! Please do campare it with the one I published a few blogs ago…Who can now say that Palaeontology is not an edge-of-the-seat thrilling ride? This entry was posted in African Prehistory, Dinosaurs, Spinosaurs, Theropods and tagged Anusuya Chinsamy, Ichtyovenator, Paul Sereno, Spinosaurus. Bookmark the permalink. 12 Responses to That was then… this is NOW! Waw! *O* Genial trabajo! Y que gran noticia. Maybe Bakker got Spinosaurus right after all. Such an awkward, forward heavy design reminds me of loons. You are absolutely correct! We already knew that Spinosaurus has all the head gear of a fisher…so everything makes sense now. What did Bakker say about Spinosaurus? Any links? Many thanks in advance. The lithe, regal dragon has become a destitute fat slob. Ichthyovenator has always struck me as wrong. I see it as an victim of an obvious injury. One of the spines is badly torqued. That can’t be normal growth. I don’t see it as a “fat blob”… on the contrary… it had a >really< long body. I agree that this might not be the definitive restoration of Spinosaurus. In any case, evidence has destroyed more than one image and more than one reputation… abad the reputation of Spinosaurus as a contender to T. rex was more about cinematic wishful thinking than any evidence… think of it as a really big fishing dinosaur! Good, powerful, muscular restoration! Love it! Wow, simply great. And talking about incredible discoveries, willo you make soon a reconstruction of the feathered ornithopod Kulindadromeus??? Is it just me, or does the rib cage look unusually small on the mounted skeleton?…Great illustration by the way. 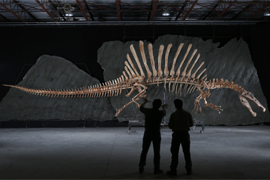 As “weird” as it might look, this new reconstruction makes Spinosaurus feel more like a real animal that inhabited a specific ecological niche in life, rather than just a generic and decontextualized movie monster. I have absolutely no idea as to what to say in response to seeing this. As Mr. Rey noted, the physical appearance of Spinosaurus has gone through a few revisions. When I was growing up in the 90’s, Spinosaurus essentially looked like an Allosaurus with a large half-circle shaped sail on its back, and for years that was the “classic” (although some would say “retro”) image. By the mid to late 90’s, people generally accepted that Spinosaurus had a Baryonyx-like skull. That image stuck for almost one and a half decades, but in the past few years, there has been a lot of heated debate as to what exactly Spinosaurus’ sail was shaped like. Traditionalists maintained the classic half-circle image, although some also suspected that the creature needed an unusually long tail to keep itself properly balanced. 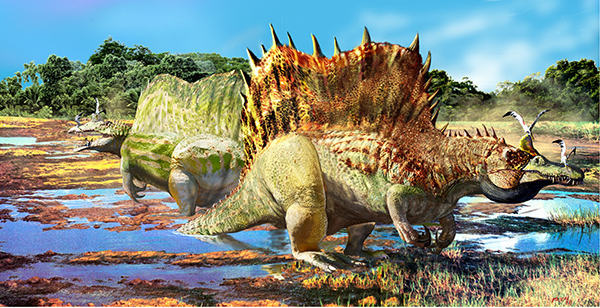 Meanwhile, some brave souls hypothesized that Spinosaurus’ sail may have gone all the way down the length of its back to the tip of its tail, similar to Ouranosaurus. This would have made it rather slow, stiff bodied, and not very agile, but then again, if you’re hunkered down beside a river waiting for fish to swim by, you don’t really need to possess great physical skills. Now, this weird B-shaped sail, which to me looks just so wrong! And is it just me, or is the animal’s ribcage stretched out a bit too much? As Mr. Rey said, I’m also not sure where Dr. Sereno got his information from to create this rather, well, attention-grabbing restoration, but I am very interested to learn more. There has to have been a mistake with the legs. There’s no way it could have supported itself on land with legs that short. I agree that the legs of the skeleton are far too short, but we have to wait to see what Sereno has to say before making any judgements…Mu question is… what if this was more like a hippo-dinosaur of sorts? A truly aquatic dinosaur mimicking crocodiles?